One of the challenges that I face when I select a photo bag is volume. I need a bag that will hold all of my gear, can be comfortably carried for long distances, is carry-on size for airlines, and is still durable enough to resist the bumps and bruises that life inevitably delivers. In an ideal world, my camera bag would shrink or expand as necessary to accommodate varying amounts of equipment. I have seen soft sided bags that do that, but flexibility comes at the cost of protection. Protecting camera gear requires a bag that has a rigid structure and firm padding. 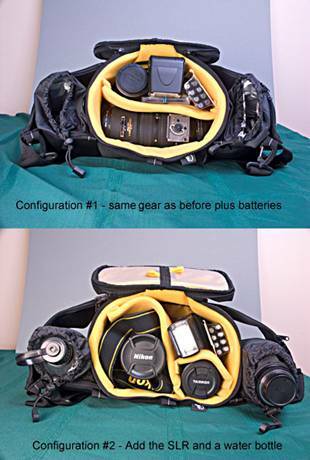 Kata has taken a unique approach to this problem by designing a system of camera bags that can be used independently or can be clipped together to form an integrated carrying solution. The Kata EPH (Ergonomic Photo) System is comprised of a series of backpacks and accessory bags that can be combined in various personalized configurations to suit the specific requirements of individual photographers. A systems approach to camera bags is not a new idea. 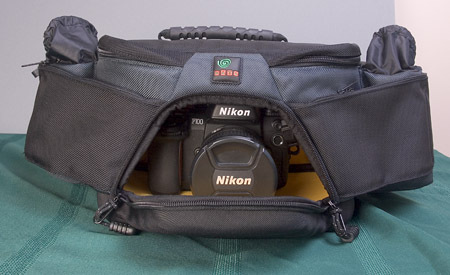 Many manufacturers produce a series of pouches and lens cases that can be strapped, clipped or Velcro-ed to their main bags to provide additional storage. Personally, the idea of having a valuable lens attached to the outside of a camera bag by only a Velcro strip has always left me a little uneasy, and I tend to avoid this type of solution. I have previously reviewed in detail the Kata R-102, which is an exceptionally capable camera backpack. 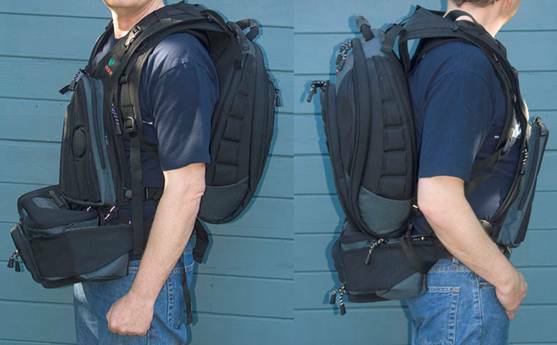 Since I wrote that review, Kata has released the R-103 backpack which is virtually identical to the R-102, but with an additional pocket to carry a laptop computer. This review will focus exclusively on the T-212 torso pack and the W-92 waist pack, in conjunction with the R-102 backpack, and all comments that I make about the R-102 in this review will also apply to the R-103. First, let’s look at the components individually. The T-212 is a sling type camera bag that is worn in front of the body. It loads from the top, and can be used as a standalone camera bag (using its detachable web strap) or clipped to the R-102 to provide additional carrying capacity. 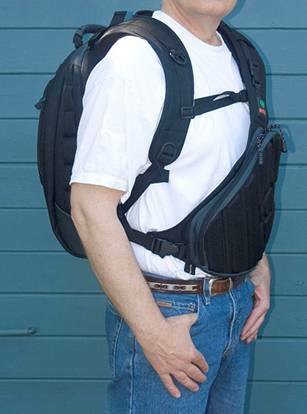 Used independently, it slips over one shoulder and fastens at the waist, making it very quick to get in and out of. It has the same rather cool bullet-proof vest look that all Kata camera bags share (Kata also manufactures body armor for the Israeli special forces). It is comfortable to wear, and is very lightweight even when fully loaded. Because it is carried in front, it is my favorite bag when I am in a crowd, or when I am in a situation where I am concerned about theft. I sometimes do live concert photos in rough bars in bad areas of town, and this bag is ideal in such an environment. A double zipper provides access to the main compartment of the T-212 which can be configured in one of 2 ways – either as one large compartment or as 2 separately accessible sub-compartments. To divide the main compartment, a center zipper running the inside length of the T-212 is provided. I find the inner zipper rather awkward to zip/unzip, and it limits what I can store in the bag somewhat, but using the zipper does have some advantages. It compresses the dimensions of the bag providing a smaller profile, and it helps prevent the contents of the T-212 from spilling out if it is opened carelessly (more on this later). The pack also has another flat zippered pocket behind the main compartment that can be used for carrying lens cleaning equipment, airline tickets, manuals, filters, iPod and other necessities. The T-212 will hold an SLR with an attached medium range zoom and one additional item (a flash or a lens for example). This configuration works well in a situation where security and ease of access is more important than carrying a lot of gear. The T-212 looks fairly lumpy when you carry an SLR in it, and an SLR with an extended grip or attached battery pack will not comfortably fit in the bag. However, for a light camera rig with a couple of selected accessories, it fits the bill very well. My usual standalone field configuration is to put 2 lenses and a flash (or 3 lenses) in the pack and wear the SLR around my neck. The T-212 will hold one long lens (example: Nikon 80-200 F2.8 ED – approximately 8.5″ long x 4″ diameter) and 2 smaller items in the second compartment. This is also the configuration that I generally use when I combine the T-212 with the R-102. One issue that I have with the T-212 is that you need to be careful how you open it. If you open the outer zipper quickly, a fully loaded T-212 tends to spring open. This is a bit disconcerting the first time it occurs, and you quickly learn to open it carefully. When using the center zipper to divide the main compartment however, it prevents this behaviour from occurring by holding the bag together securely. 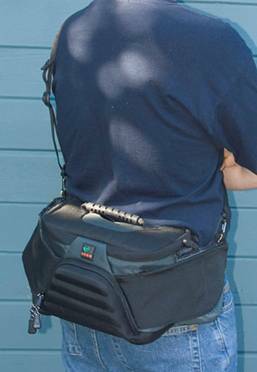 The W-92 is basically a fanny pack on steroids. As a standalone unit, it can be worn either on the front or on the back of the body and it fastens securely with a non-detachable waist belt. It also has a detachable shoulder strap that can be used to distribute the weight of the pack when carrying heavy loads. The central compartment of the W-92 is approximately 10″ x 7″ x 6″ with adjustable dividers that allow you to configure the inside space to fit your equipment. Outside of the main compartment are 2 padded tubes that will allow you to place additional lenses, water bottles or other gear in a “ready” position. Each padded tube is approximately 6″ tall x 4″ in diameter, and has an additional 2″ nylon sleeve with a drawstring closer that can be used to contain the contents more effectively. The lid of the bag has 2 web pockets for additional small gear such as memory cards, lens cleaning fluid or filters. 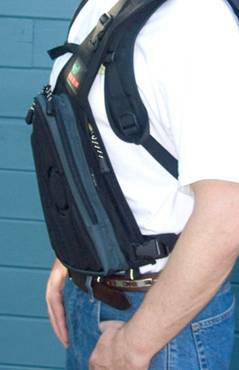 The waist strap also has 2 small (iPod-sized) zippered pockets. A rapid access port is located on the front of the W-92 which, in theory, allows you to get at your camera quickly without having to open the top. I say “in theory”, because unlike the superb rapid access port of the R-102, the W-92’s access port is too small for my SLR to pass through without significant effort. For a company that excels at design, this seems a strange oversight. The access port also has a very small zipper pocket on the inside big enough to hold a USB cable or 2 rolls of film. What will the W-92 hold? The main compartment is fairly deep (6″) but has a small footprint. 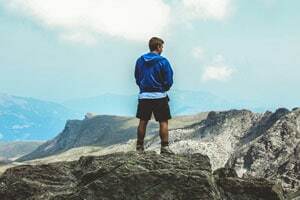 I tried several configurations of gear, and none of them quite worked to my satisfaction – either the bag was unbalanced, or I had space wasted, or things were difficult to access quickly. Unlike the shallow, wide footprint of the R-102 which allows me to carry more gear than I realistically need, the W-92’s layout does not lend itself to efficient use of the available space. The side tubes are not something that I typically use for carrying lenses – I like to carry them in the main compartment where they are protected from bumps and the weather. However, this can be a practical arrangement on location for quick lens changes. The main compartment is not tall enough to store long lenses vertically, and if you lay them down (as in configuration #1), there is a significant amount of wasted space. I also find that the small pockets are too small for most accessories such as Cokin filters, battery chargers, or lens hoods. These are my usage patterns though – your mileage may vary. The T-212 has only one position in a combined pack configuration. The back web strap is removed, and the T-212 is attached to the R-102 with provide Slik-Clips. The W-92 can be attached either in front of the body beneath the T-212 above or in back beneath the R-102. Here are photos of the 2 configurations of all 3 bags. The front configuration of the W-92 gives the best weight distribution when you are carrying a heavy load and the best access to the gear in the W-92. Maybe it’s just me, but I feel a little uncomfortable walking on the street with the W-92 in the front configuration – it may be just the thing in a war zone, but it looks pretty strange where I live. I hate to sound like a slave to fashion and harp on this point, but the Kata bags look so darn good that combining them in a way that degrades that style just doesn’t seem right. Having the W-92 in the back configuration though, presents its own set of problems. The hinge for the top lid of the W-92 is on the front of the bag, so that it opens away from your body. This is an excellent and efficient arrangement when used as a standalone camera bag, but is problematic when it is strapped under the R-102. In this configuration, the zippers and the top opening are covered by the pack, making it very difficult to open. The same is true, albeit to a lesser extent, when the W-92 is used beneath the T-212. One of the criticisms that I have heard about the R-102 is that it does not include a waist belt. Personally, I haven’t found this to be a problem even on some major back country hikes, but if that is important to you, coupling the R-102 with the W-92 solves that problem nicely. So how do I actually use this system? To be brutally honest, I rarely carry the W-92. On a major back country hike, I will carry it, but primarily as a space to carry food, water and basic survival gear. It integrates well with the R-102, and the outer tubes fit water bottles perfectly. The waist belt helps support and balance the entire load. Maybe I’m cheap, but I think $70 US is a lot of money to pay for a lunch box and waist belt, however. On the other hand, I really like the T-212. In any environment where I do not want to be constantly removing the pack to access lenses and filters, the T-212 makes a superb rapid access pouch to carry my most regularly used items. As a standalone bag, it has size limitations, but works beautifully in conjunction with the R-102. My configuration of choice would be the R-102 and the T-212. This combination is functional, stylish and tough, and still falls within the range of acceptable airline carry-on size. Rob’s advice: If you own the R-102 or R-103, buy the T-212 and give the W-92 a miss. If you don’t own the R-102 – buy that first, and then decide if you need the extra capacity/flexibility. 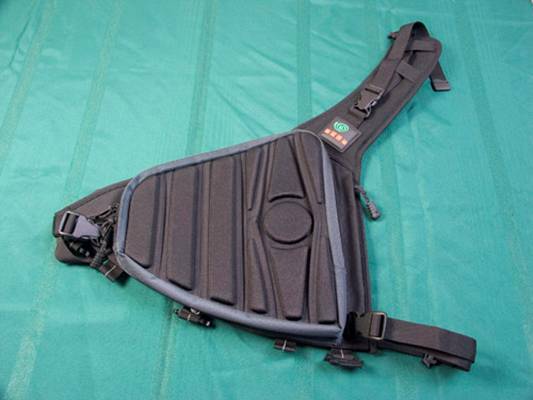 More info on the Kata T-212 Torso Pack and W-92 Waist Pack can be found on their web site. Support Shuttertalk by purchasing the Kata T-212 or W-92 on Amazon with free shipping!